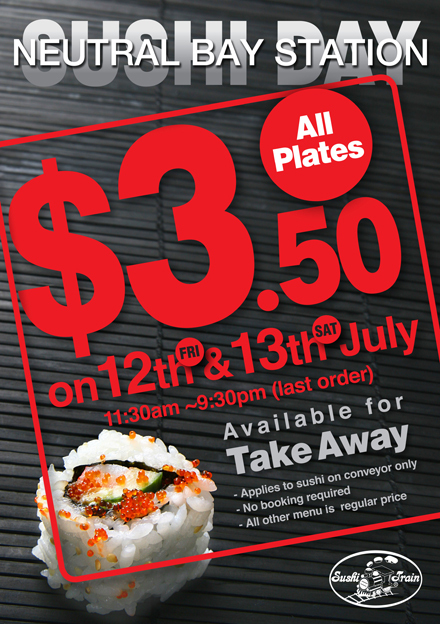 The Sushi Train Greenslopes in QLD will be open for Lunch only 11am - 4pm 16th Dec 2013. 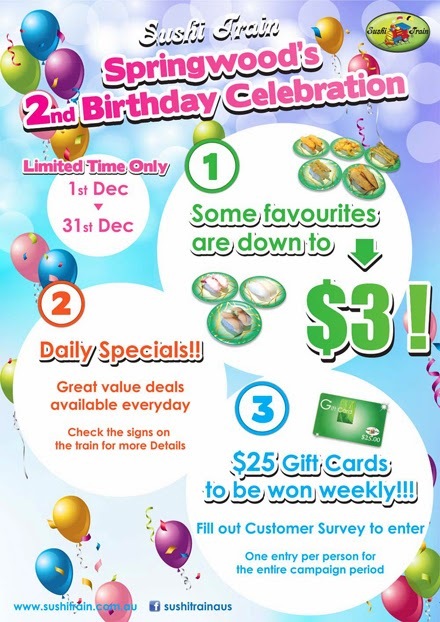 But we will reopen 17th Dec 2013 11am - 9pm. 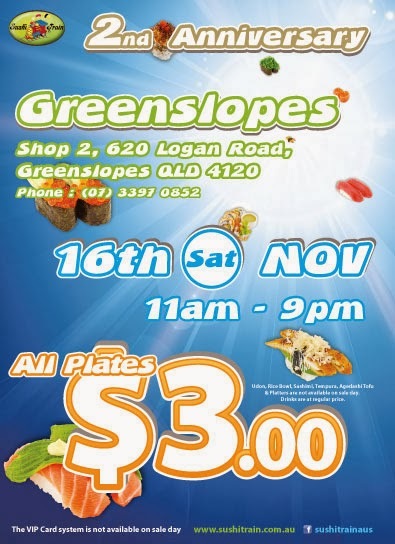 Management of the Sushi Train Greenslopes. The Sushi Train Indooroopilly Junction in QLD will be open for Lunch only 11am - 4pm 17th Dec 2013. 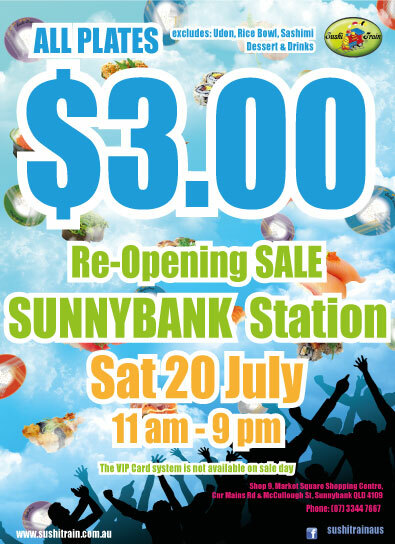 But we will reopen 18th Dec 2013 11am - 9pm. 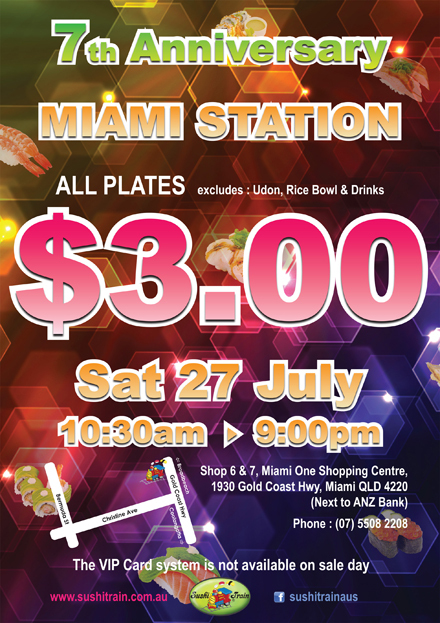 Management of the Sushi Train Indooroopilly Junction. 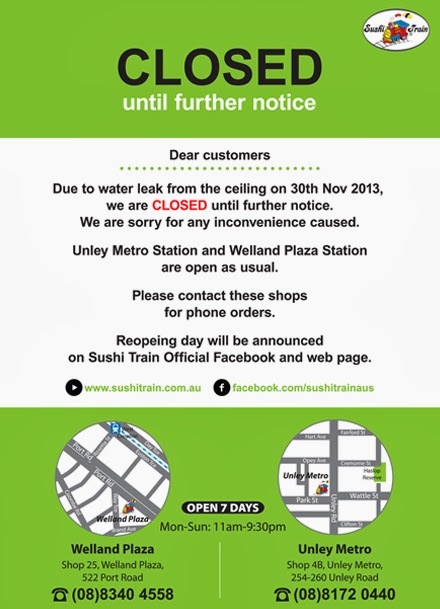 The Sushi Train Newtown Station in NSW is to be closed on Sunday 20 Oct 2013, due to the minor shop maintenance. Management of the Sushi Train Newtown Station. 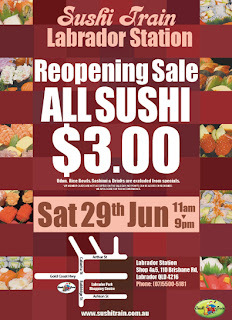 Management of Sushi Train Newtown Station. 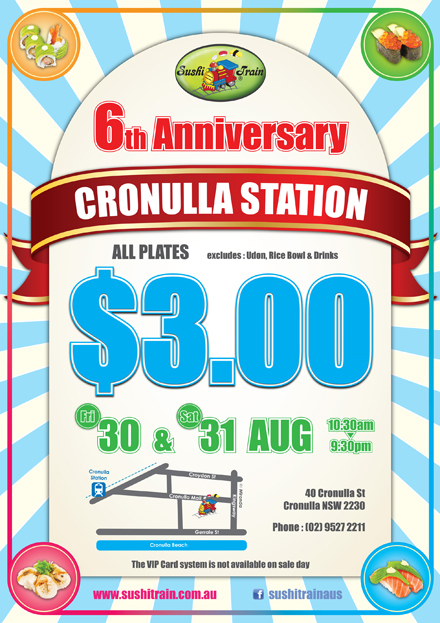 Sushi Train Cronulla Station 6th Anniversary $3 Sale!! 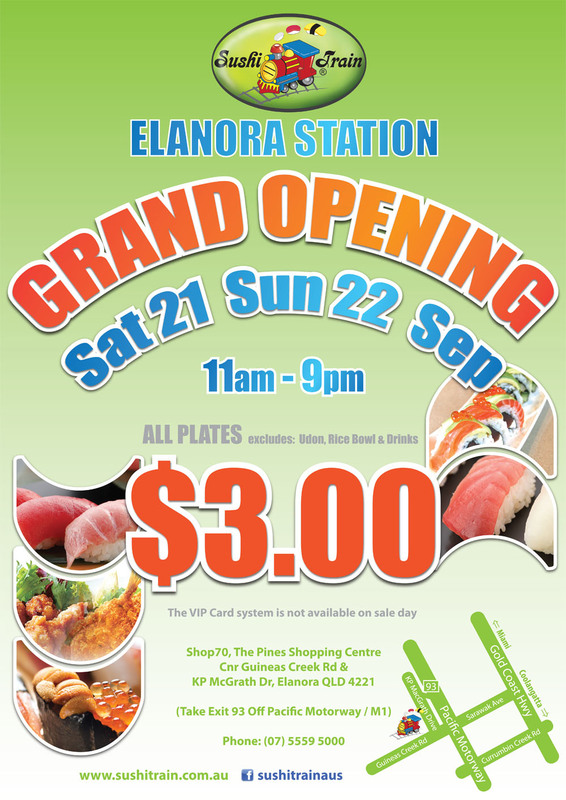 The Sushi Train Springwood Station in QLD will be closed on Monday, 12 August 2013, due to Logan City Show Day. 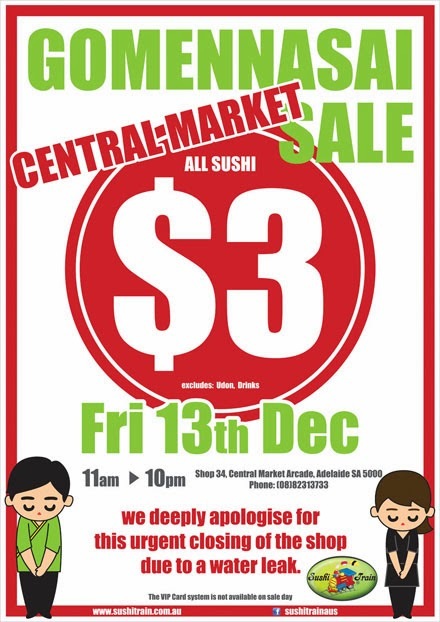 We regret to inform you that as of 1st August 2013, the Sushi Train Chatswood has been closed permanently. 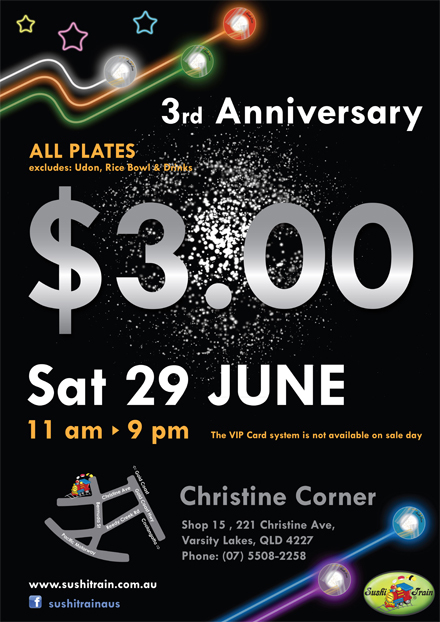 We thank you so much for your business and for your support through the years. We hope that you will visit at our other locations. 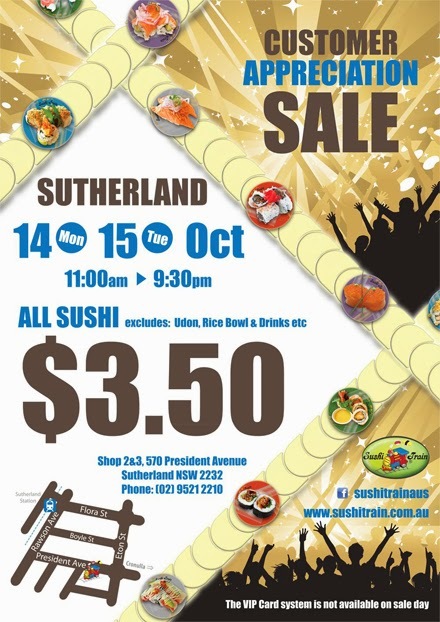 For enquiries, please visit sushitrain.com.au. 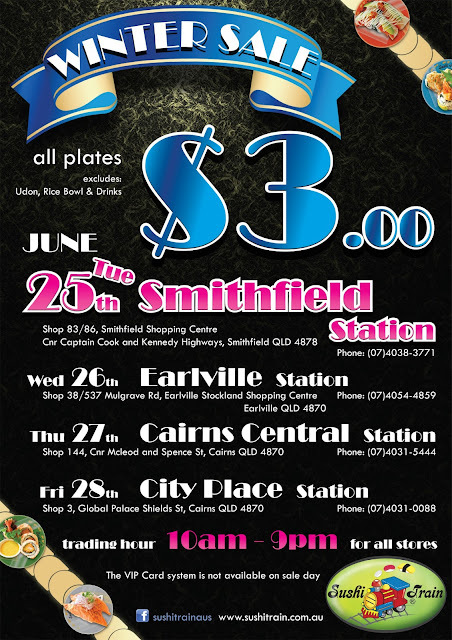 Sushi Train Stations in Cairns Winter $3 Sale!! 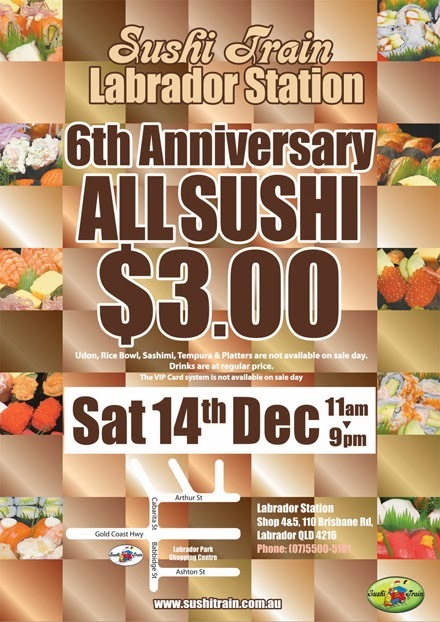 Management of Sushi Train Labrador Station. 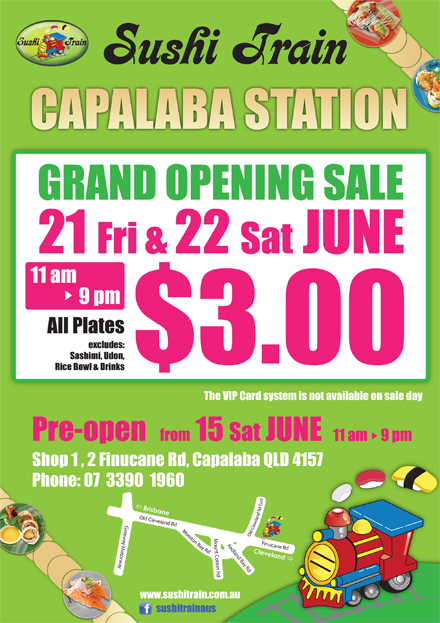 Sushi Train Capalaba Station Grand Opening $3 Sale! 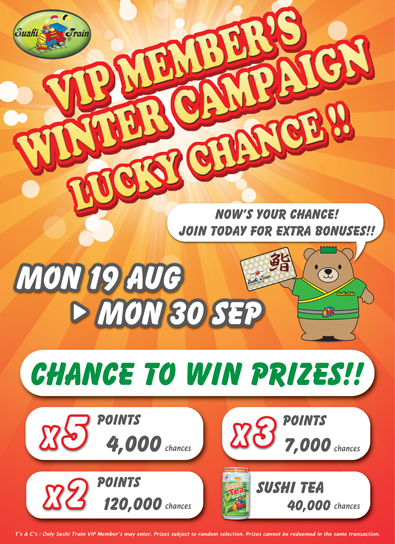 excludes: Udon, Rice Bowl, Drinks and Sashimi. 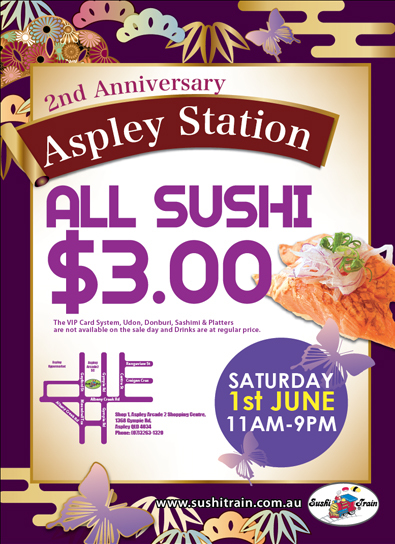 Sushi Train Aspley Station 2nd Anniversary $3 Sale!! 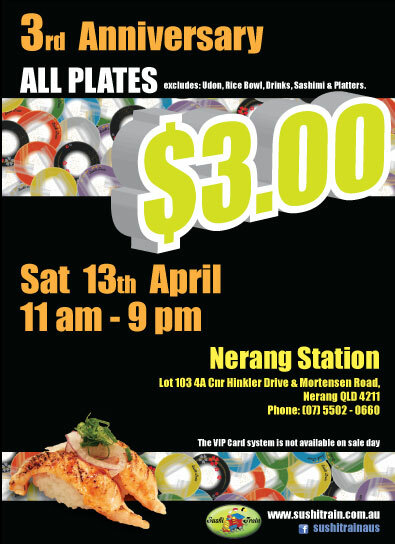 excludes: Udon, Donburi, Drinks, Sashimi and Platters. The VIP Card system is not available on the sale day. 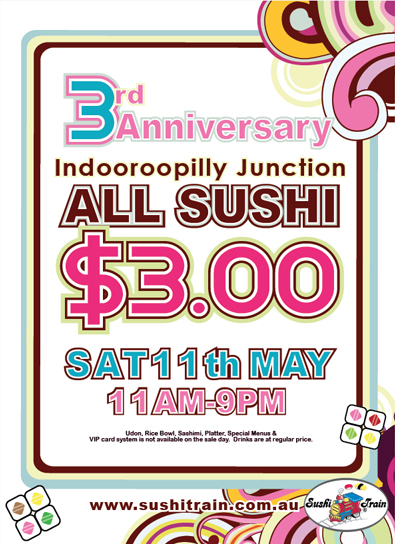 Sushi Train Indooroopilly Junction 3rd Anniversary Sale!! 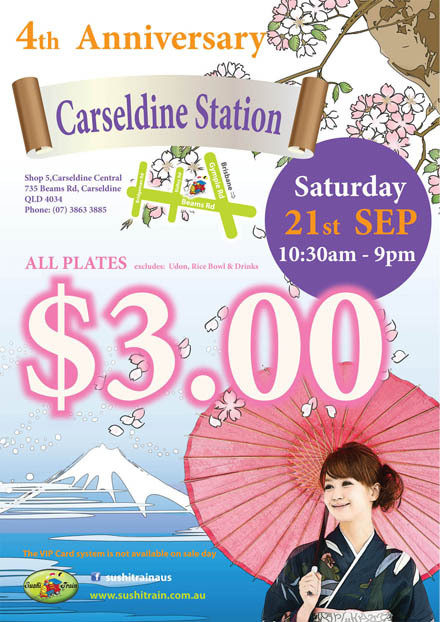 excludes: Udon, Rice Bowl, Drinks, Sashimi, Platters and Special Menus. 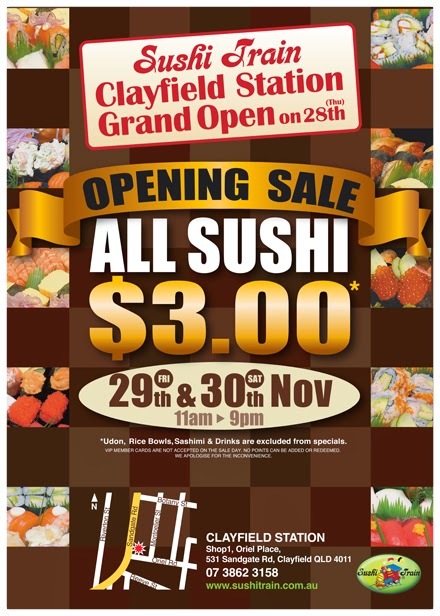 Sushi Train St. Clair Station Grand Opening $3 Sale!! 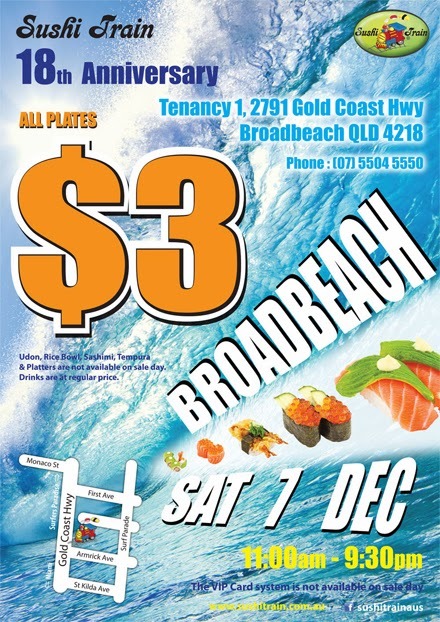 excludes: Udon, Rice Bowl, Drinks, Sashimi & Platters. 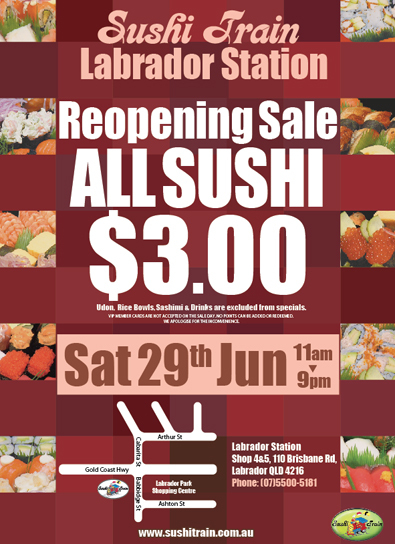 The Sushi Train Indooroopilly Junction in QLD is to be closed on Monday 15 April and Tuesday 16 April 2013, due to the minor shop maintenance. 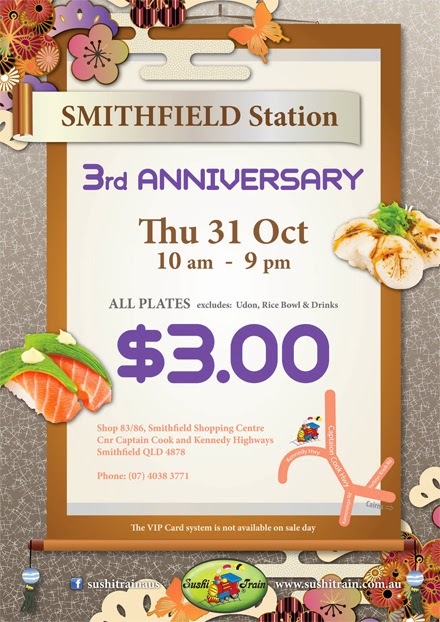 Sushi Train Nerang Station 3rd Anniversary $3 Sale! !